However, as researchers attempt to create increasingly complex materials to address increasingly intricate industrial needs—such as improved material resiliency for high-temperature processes, or compression processes that effect materials for flight—the ability to uncover and understand materials' properties experimentally has gotten costly in terms of resources, energy, money and time. Nestler, who was recently awarded the 2017 Gottfried Wilhelm Leibniz Prize by the German Research Foundation, and her team with the help of the High Performance Computing Center Stuttgart's (HLRS's) Cray XC40 Hazel Hen supercomputer—have scaled to new heights in their multiphysics and multiscale modeling and simulation efforts. Materials scientists are often seeking to understand the limits of materials—the hottest temperature a mixture can operate at, the highest pressure it can withstand, among others. One topic of interest is understanding properties of eutectic materials consisting of two (binary eutectic) or three (ternary eutectic) distinct solid phases in a microstructure arrangement that results in the lowest melting temperature. The Nestler team has recently focused on ternary eutectics with three alloy components. Using Hazel Hen, the team simulates how certain process conditions—such as solidification velocity or processing temperature—effect a eutectic material's microstructure. 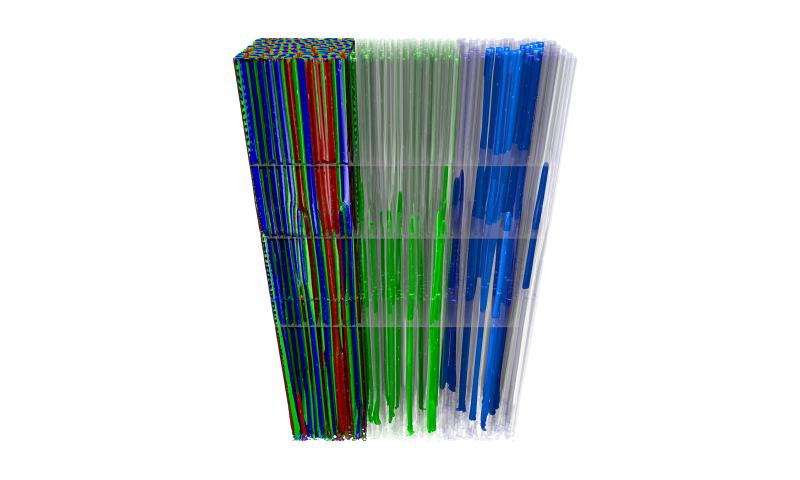 To deduce correlations, the team needs large-scale 3D computations to simulate a representative sample of microstructural patterns. Before its recent simulations, for example, the team hypothesized that when an Al-Ag-Cu transforms from liquid to solid, the speed of the solidification transition plays an important role in how a microstructure's pattern splits and merges, and how the length and width of the fibers that subsequently form influence the material's strength at higher temperatures. This code breaks down massive 3D simulations into roughly 10,000 computerized cubes, then solves a variety of physics equations within each cell for millions of time steps—each step is in the range of 0.1 to 1.0 microseconds. To observe velocity variations, the team ran sets of simulations with variations in solidification velocity. Each simulation needs roughly one day on approximately 10,000 of Hazel Hen's CPU cores. As experiments continually get more complicated—the Karlsruhe experts in computational materials modelling have collaborated intensively with experimentalists doing zero-gravity material design research on the International Space Station—computations will continue to play a larger role. Nestler indicated that experiments such as those on the ISS were extremely important, but also expensive and time consuming to prepare; supercomputing methods help researchers to make large strides toward charting tailored materials with specific properties for particular applications while also bringing down the cost. Computing also allows researchers to run many permutations of the same simulations with very subtle differences—differences that would otherwise require dozens of individual experiments. "In our simulations, we can vary physical and processing conditions, such as the solidification velocity, which have an influence on microstructure. By controlling this parameters, we end up getting a well-designed, tailored microstructure," said Nestler.